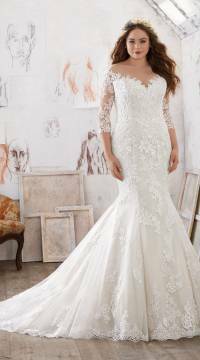 This Classic Fit & Flare Wedding Gown Features Exquisite Alençon and Venice Lace Appliqués on Net. The Off-the-Shoulder Illusion Neckline and Three-Quarter Sleeves Add a Touch of Romance. Covered Button Back Detail and a Delicate Scalloped Hemline Complete the Look. Available in Three Lengths: 55″, 58″, 61″. Colors Available: White, Ivory, Ivory/Coco. Shown in Ivory/Coco.